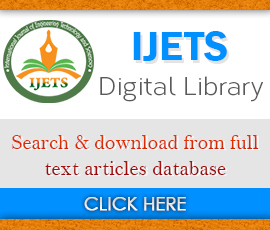 The International Journal on Engineering Technology and Sciences (IJETS) is a monthly open access peer-reviewed journal that publishes articles which contribute new which contribute new ideologies, Technologies and results so as to promote research in all the areas of science and technology. The goal of this journal is to bring together researchers and practitioners from academia and industry to focus on advanced wireless & mobile networking concepts and establishing new collaborations in these areas. The journal welcomes authors to contribute by submitting articles that illustrate significance, academic excellence great ideologies, Projects, surveying works and research results that describe significant advances in Engineering and Technology. International Journal on Engineering Technology and Sciences (IJETS) cover all topics under the Computer Science and Engineering, Information Technology, Electronics and Communication, Electrical and Electronics, Electronics and Telecommunication, Civil Engineering, Mechanical Engineering and all technology and sciences(Health Science, Social Science, Physical Science & Life Science).